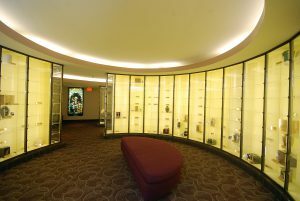 Do you know what a Columbarium is? Do you realize that you can do a corporal act of mercy and visit the dead right here at Sacred Heart parish? Right below the Church is a crypt where urns are placed. Praying for the dead is an act of mercy and charity. Just ask our receptionist for the code and take a trip down using the elevator or the stairs. If you haven’t been to the Columbarium, you will be impressed by the beauty and prayerful environment. The Canadian Catholic Church says: “Scattering cremated remains on the sea, in the air, on the ground, or keeping them in the homes of relatives does not display appropriate reverence and the Church does not offer a prayer service when that kind of disposal has been chosen.